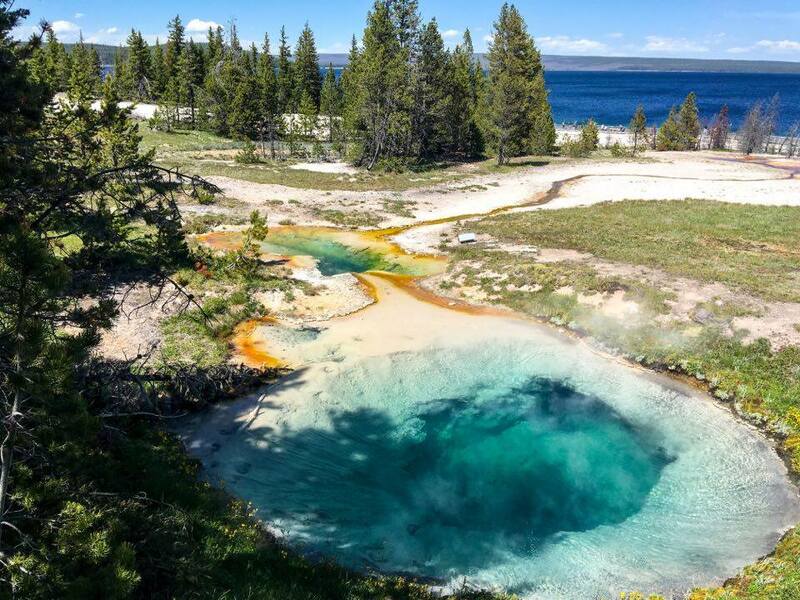 We’ve all seen geysers on TV or in the movies, and many would think that seeing them in person would be no different. There might even be others who will say it’s boring. But believe me, if they saw what I did in Yellowstone, they would know they’re dead wrong! 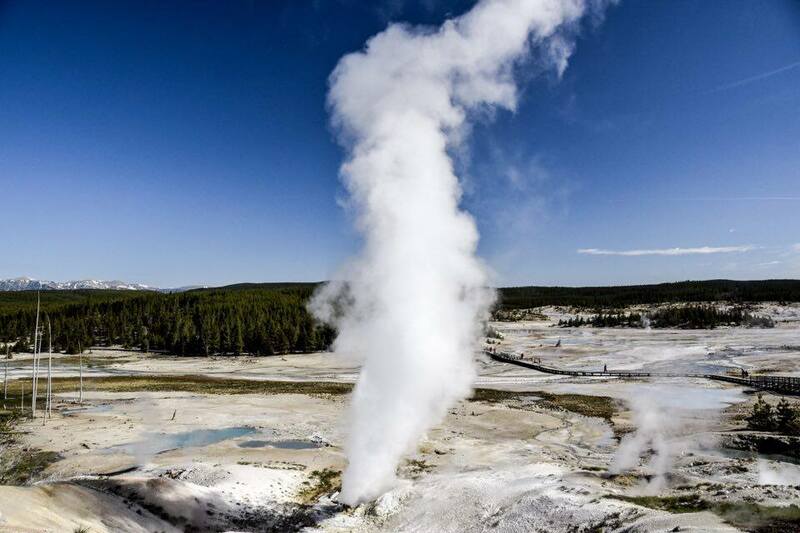 Yellowstone has a lot of geysers, but perhaps the most famous of them all is Old Faithful — so named because it erupts “faithfully” in an almost regular interval. 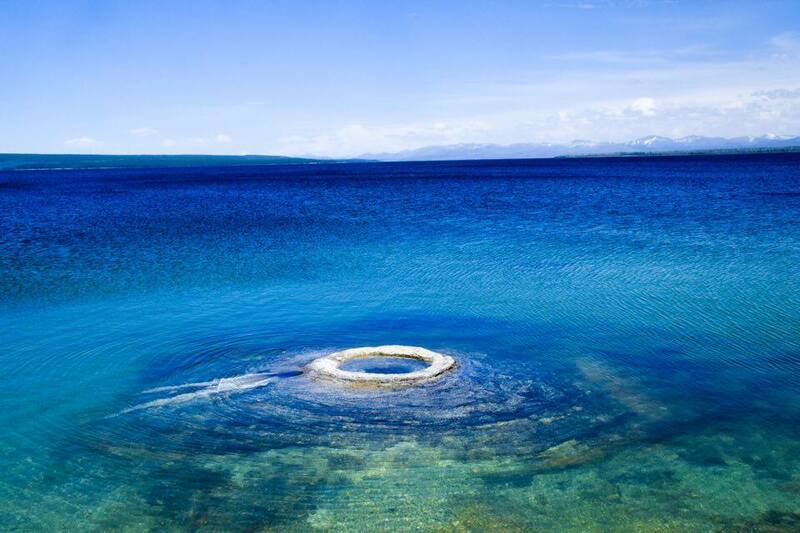 It is one of the most famous features of Yellowstone, and you can find people sitting around in a circle (like we did!) just to see it erupt. This happens roughly every hour and a half, give or take 10-15 minutes. Aside from Old faithful, there is also the Norris Geyser Basin. This is like a cluster or collection of geysers,. The open area is a hotbed for geothermic pressures, forcing up hotsprings and geysers. 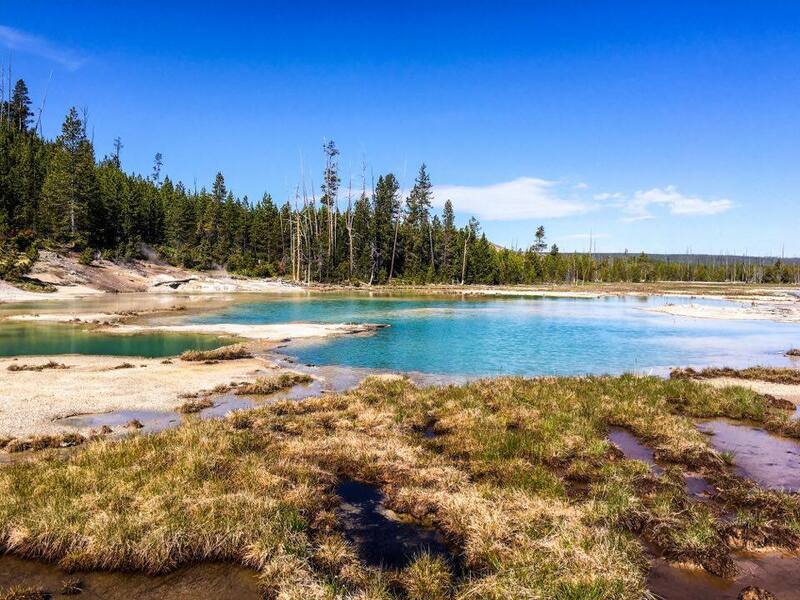 Out of the many geyser basins, Norris is one of the most accessible. 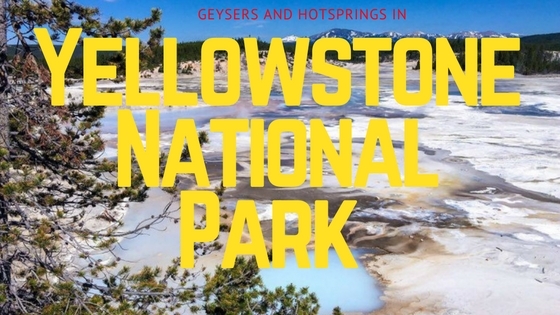 Scientists say that Yellowstone National Park is a giant supervolcano waiting to happen (in the far future), so this explains the abundance of geyser basins in the area. The geysers were an absolute fun to watch! The plumes of steaming hot water shoots up from the ground, like the blowholes of whales. Once up there, it looks like a cloud that jumped up from the earth. The colors were also amazing — you can see small lines of rainbow colors where the sunlight strikes the dissipating steam. Of course, where there are beautiful geysers there would also be large hot springs. We were treated to the Grand Prismatic Spring, which is the largest hot spring in the US. It is also the third largest hot spring in the world, beaten only by the (less enticingly named) Frying Pan lake of New Zealand and the Boiling Lake in Dominica. 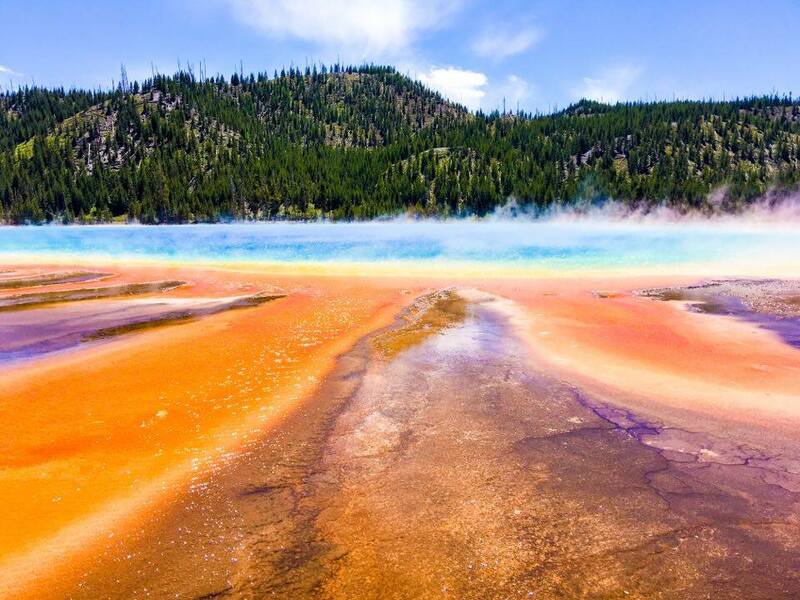 Grand Prismatic is also located in a geyser basin, the Midway Geyser Basin. The lake was named “prismatic” for a reason — its gorgeous colors look like a giant prism! The bright orange color of its outer edges thins out to a band of vivid yellow. This then fades to green, then aquamarine, before eventually dissolving into a deep blue that evokes deep-sea vibes. Simply awesome to see. We are told that the color at the edges comes from a colony of bacteria. This bacteria feeds off the mineral-rich water. Our guide says that in the summer, the entire lake is covered in a red-orange shade. That’s the bacteria multiplying. However, this marvelous beauty can also be deadly. The steam is so hot it can easily kill — in fact, the week before we were there, some people died after falling into one of the pools. The colors may be very inviting, but it will boil you alive if you jump in. There is no margin for error(wide enough already!) — so, don’t stray from the path! During the walks, there are times when you will pass quite close around the edges of the hot springs. It’s a curious feeling when that happens — the hot air coming from the springs meets the cold breeze from outside, and you are right there in the middle! If you are wearing glasses, it would fog up for sure. 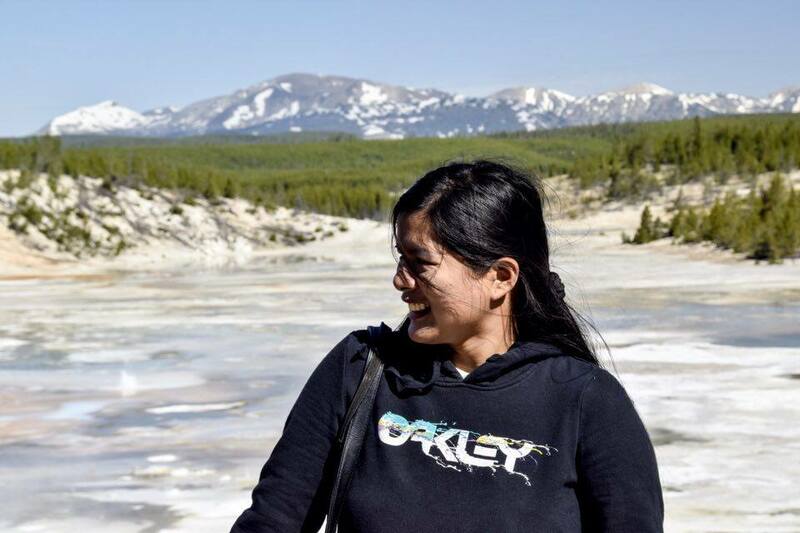 Let’s just call it a “necessary evil” so you can see the beauty of Yellowstone National Park! Aside from the geysers and the hot springs, we also visited other beautiful views in Yellowstone. 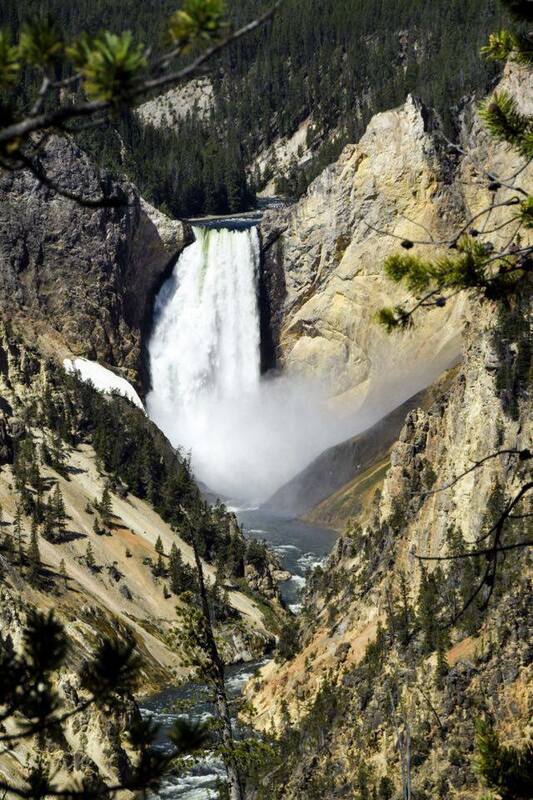 One place of notice is the “Artist’s Point” — a view of Yellowstone’s magnificent waterfalls. It is a marvel of nature — it is as if the rocky mountains part just to give one a glimpse of the white rapids cascading down from the falls. The entire landscape has a refreshing brightness to it. It is said that the place was popularized by the waterfall sketches of artist Thomas Moran — hence the name. Another interesting point of the tour was the “Grand Canyon of the Yellowstone”, which is a large gap in the earth spanning 24 miles long. The Artist’s Point is merely a part of this huge wonder. 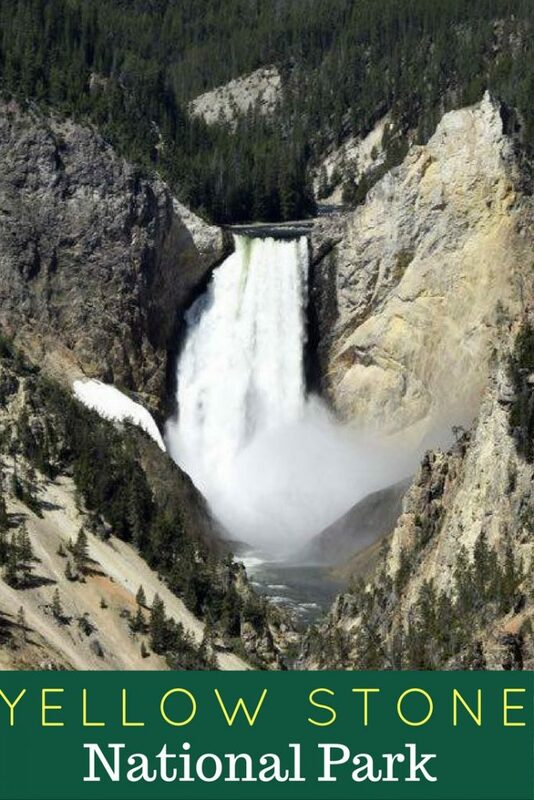 Yellowstone National Park is famous in the world due to its wonderful scenery and diverse wildlife. Take it from me — if you have any chance at all to visit it, by all means do so! It is definitely worth it– money, effort and time. I have always wanted to go to Yellowstone. I hope I get there someday. These are such gorgeous photos! We’ve been trying to get a trip Yellowstone going for a few years now, but we still haven’t been able to make it happen. Oh wow. The colors are so vibrant and unique. It’s hard to believe it comes by those colors naturally. I’d love to take the family there. Yosemite national Park looks beautiful. I would love to see those Hot Springs in person. You have convinced me to want to visit this place. Are there any places in the park that you can go in the water? This has always been on my bucket list! Oh my, I totally need to plan a trip to Yellowstone. Everyone should definitely need to see Old Faithful and that beautiful hot spring. Omg! This place looks amazing. These pictures are beautiful, definitely I have to go there some day. I would love to visit this. It’s actually inspiring me to maybe go next year. I’m you said Wyoming’s Yellowstone National Park is closed six months a year. I didn’t know that yet. Your pictures are stunning. I can’t imagine how anyone who would read this wouldn’t want to go. I was so impressed by the pools, but shocked to read people died after falling into one of the pools. Your trip seems incredible! Seeing old faithful is a good enough reason to visit Yellowstone park by itself. The rest of the park is beautiful too and one could get lost in the beauty of nature for a couple weeks. I would love to go there. Exploring the beauty of these natural formations, watching the geysers and being surrounded with so much serenity is awesome! I love the prism lake! Thank you so much for the virtual tour. I enjoyed the pictures. I have always wanted to go to Yellowstone. It looks so beautiful! I know that someday I will go! I think it would be a great family trip. Yellowstone will always be one of my favorite places to visit. Watching the geysers is so relaxing, there’s some sort of peacefulness to it, don’t you think? I would love to take the kids here some time soon! The geysers are so fun to watch and it’s an awesome learning experience for the kids too. It’s beautiful out there! You can’t deny how breathtaking the geysers are! Lucky you, you got the chance to see them up close. I would love to go there and just spend the entire afternoon walking around with the family. I’ve always wanted to go to Yellowstone. It looks so beautiful there! I’d love to see the Prism Lake up close. 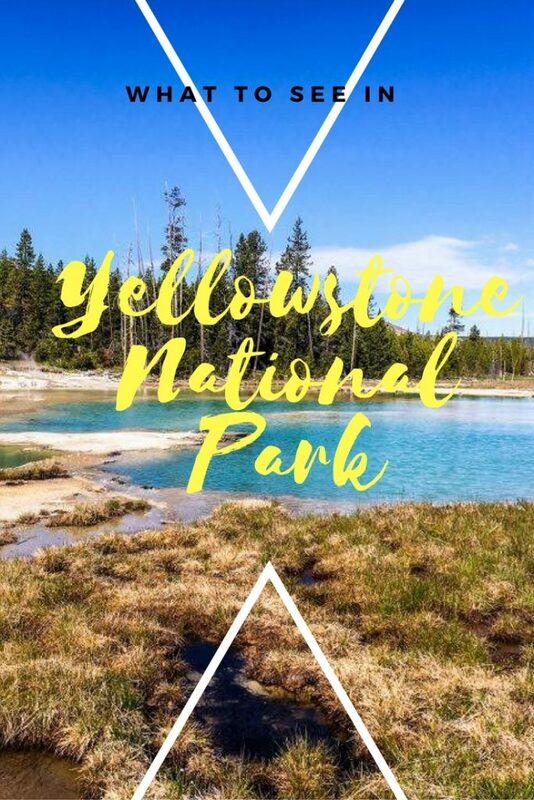 I’ve only seen them in pictures and I know there is much more to see when I get the chance to visit Yellowstone National Park. Thank you for the virtual tour! I’ve never been to Yellowstone National Park but my parents have and recommend it to everyone. Your photos are so interesting, I can’t wait to go. It’s really beautiful and quite peaceful in the nice place! I really wanted to see personally this place. when I hear Yellowstone park.. I remember Yogi bear…I really want to loo see those pics in person.. thanks for sharing! Take me shopping and I will refuse to walk with you, but take me to the Yellowstone National Park and I will be the last to leave. It is so beautiful! I would love to be right there the moment geysers erupt! You are truly blessed to be able to visit! It has always been a dream of mine to visit Yellow Stone park. Wow. Those pictures are incredible and it makes me want to go even more now. It would be cool to see Old Faithful but the Grand Prismic Spring looks phenomenal. 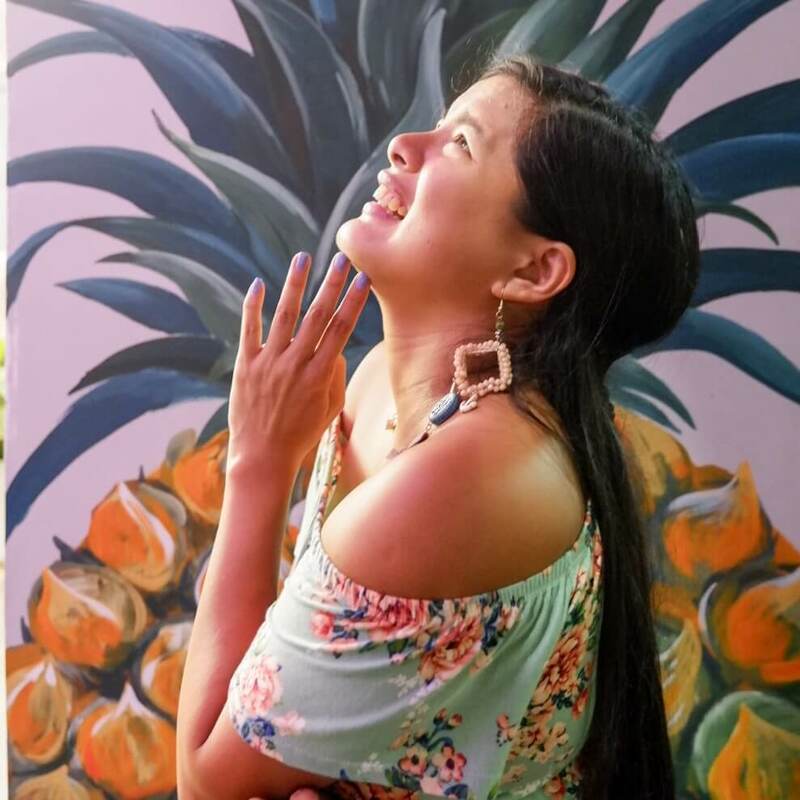 Your photos are beyond amazing! I almost feel like I’m visiting through them. This place is definitely on our bucket list! Your photos are beautiful! I went to Yellowstone when I was 12 but I haven’t been back since. I loved Old Faithful and all the different colors in the water. But I didn’t know they came from bacteria! Thanks for sharing! You’ve picked all my favorite places from Yellowstone. The steam walk is truly amazing. I just love all the colors. I love love love Yellowstone! It’s unbelievable and simply breathtaking. I am so jealous! I’ve always wanted to go here ever since my dad told me about it Gorgeous place! Oh, I have to agree, the waters are so inviting, but upon learning how they can burn you alive in seconds, omg! that’s super scary!!! But it’s such a wonderful place, I agree, it’s worth it! I wish I could visit this place but I’ll be honest I’ve never been to anywhere outside the PH! lol. Yosemite Park has been one the favorite places to visit for long. These pictures are so beautiful & inviting that I would love to go for a trip right away. The water Falls looks just stunning & it is going to be a great experience. 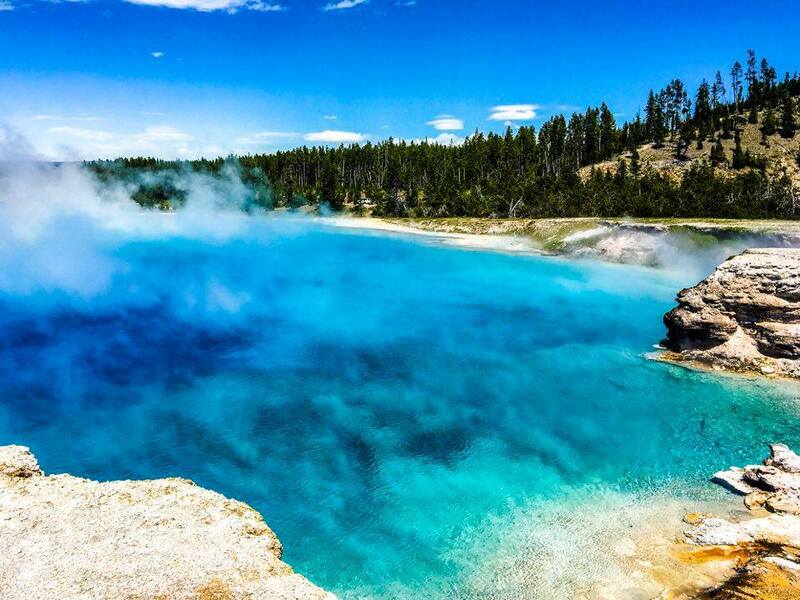 Wyoming’s Yellowstone National Park looks amazing. I would love to go and explore it. These are beautiful photos. I am making it my mission to view Yellowstone at some point, the geysers may be deadly but they are also stunning! Beautiful pictures of the geysers. I’ve never seen one myself. Yellowstone is a definite “to-go” place if I ever visit US. Just yesterday I saw that supervolcano of Yellowstone erupt (was watching 2012). Gosh, I hope that never happens. What beautiful pictures. you definitely captured the beauty of nature! very heavenly! A trip to Yellowstone has always been on my bucket list. But, your pictures make me want to go now! It’s definitely moved up the list to the top for a visit! Wow. All the pictures are superb! Wish i can go here too! Yellowstone is definitely one of those places that is on my list to visit. I will make it one day! Wow. This is really a great post. 🙂 I mean, this is so amusing and really makes me love nature more. People like you who get to go there are really lucky! I would love to visit Yellowstone, the photos look simply amazing! That waterfall is stunning! Wow! This place is really amazing! I want to go there so soon! Those are amazing pictures. Looks like a beautiful park to visit. I would absolutely love to go to Yellowstone one day! And amazing pics you have! Love em! Wow! These pictures are beautiful. This year’s Philadelphia flower show had a national parks theme. The displays made me want to visit Yellowstone. This pictures make me want to go immediately. First time to know about this place and I’m not sure if I can see this up close and personal but I enjoyed your lovely photos. Sad to know that there were people died there, I hope there are warnings or signs to prevent it, I don’t want be boiled alive too. This place looks so amazing and so beautiful. God is powerful to made this place. Oh I hope I can visit even atleast one of this place someday before I die.